Young Octavian is being raised by a group of rational philosophers known only by numbers — but it is only after he opens a forbidden door that learns the hideous nature of their experiments, and his own chilling role them. Set in Revolutionary Boston, M. T. Anderson’s mesmerizing novel takes place at a time when Patriots battled to win liberty while African slaves were entreated to risk their lives for a freedom they would never claim. The first of two parts, this deeply provocative novel reimagines past as an eerie place that has startling resonance for readers today. M. T. Anderson is the author of several books for children and young adults, including FEED, which was a National Book Award Finalist and winner of the Los Angeles Times Book Prize. M. T. Anderson lives in Cambridge, Massachusetts. Anderson’s imaginative and highly intelligent exploration of the horrors of human experimentation and the ambiguous history of America’s origins will leave readers impatient for the promised sequel. Fascinating and eye-opening… this powerful novel will resonate with contemporary readers. 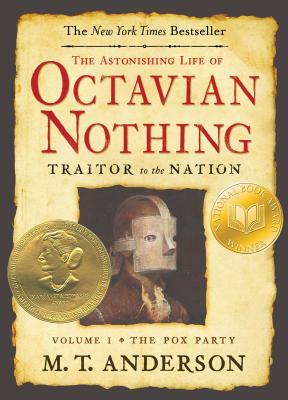 Octavian's narration...quickly draws readers into its almost musical flow, and the relentless action and plot turns are powerful motivators. A serious look at Boston, pre-Revolution. It's layered, it's full of historic reference, and it's about slavery and equal rights. The story’s scope is immense, in both its technical challenges and underlying intellectual and moral questions. . . . Readers will marvel at Anderson’s ability to maintain this high-wire act of elegant, archaic language and shifting voices. With an eye trained to the hypocrisies and conflicted loyalties of the American Revolution, Anderson resoundingly concludes the finely nuanced bildungsroman begun in his National Book Award–winning novel.